A tasty snack that can be used as a training aid or simply as a reward. Europa treats are completely free of wheat, gluten, soya and bone meal making them a great treat for all types of dogs. 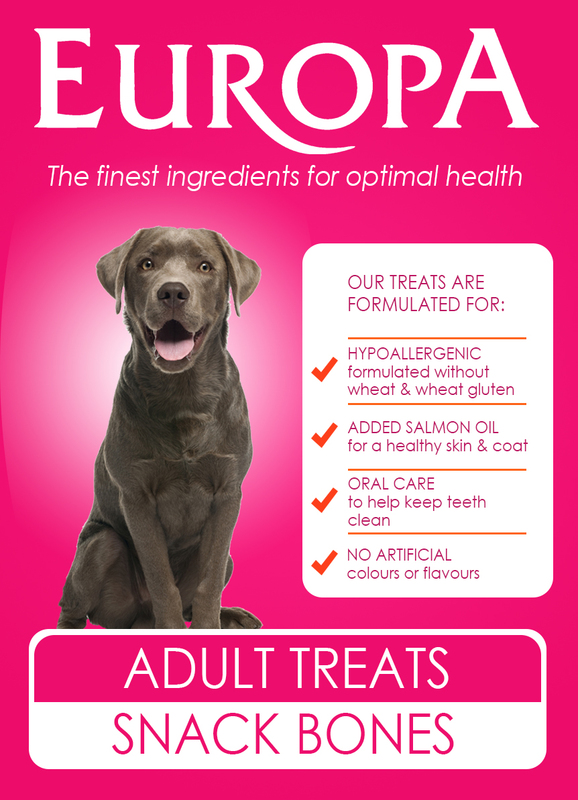 Europa treats are designed so even dogs with sensitive skin and stomachs can enjoy them too ! Crude Protein 22%, Crude Oils and Fats 14%, Crude Fibres 3%, Crude Ash 5%. Maize, Poultry Meal, Rice, Potato, Poultry Fat, Sugar Beet Pulp, Brewers Yeast, Chicken Hydrolysate, Salmon Oil, Fructooligosaccharides, Yucca Schidigera Extract. *FREE DELIVERY ON TREATS IS ONLY AVAILABLE TO CUSTOMERS PURCHASING EUROPA PET FOOD , ROYAL MAIL PARCEL PRICES WILL BE CHARGED ON ORDERS FOR TREATS ONLY. YOU WILL RECEIVE AN EMAIL TO CONFIRM TOTAL PRICE.